Yesterday was panda-in-crimes birthday. Since we’ve been watching the pennies and subsisting on a soup, pasta and pizza diet for the last month, he was especially pleased to go totally carnivorous on his special day – especially since our lovely butcher was doing a special offer on steak. 2lb of meat heavier + £9.99 lighter = one very happy panda. Truth be told, he was expecting a fry up for breakfast. I’m not a fan of the full English, but thought of a meaty surprise that would perfectly complement our breakfast tipple: a Bloody Mary and an even bloodier steak tartare. 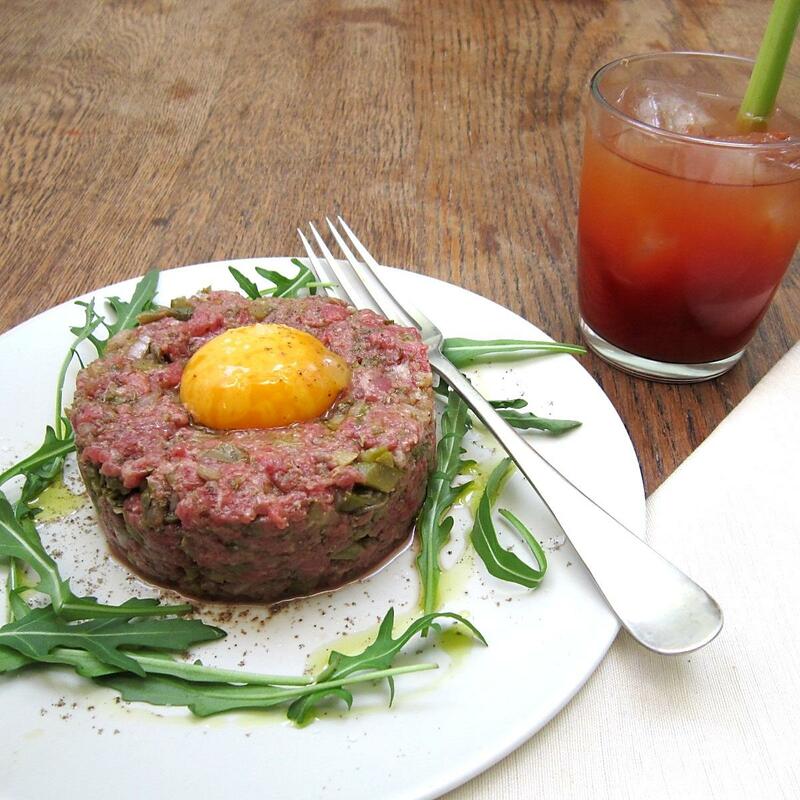 I am well aware that the thought of eating raw meat has most people running for the door, but steak tartare is a French classic. 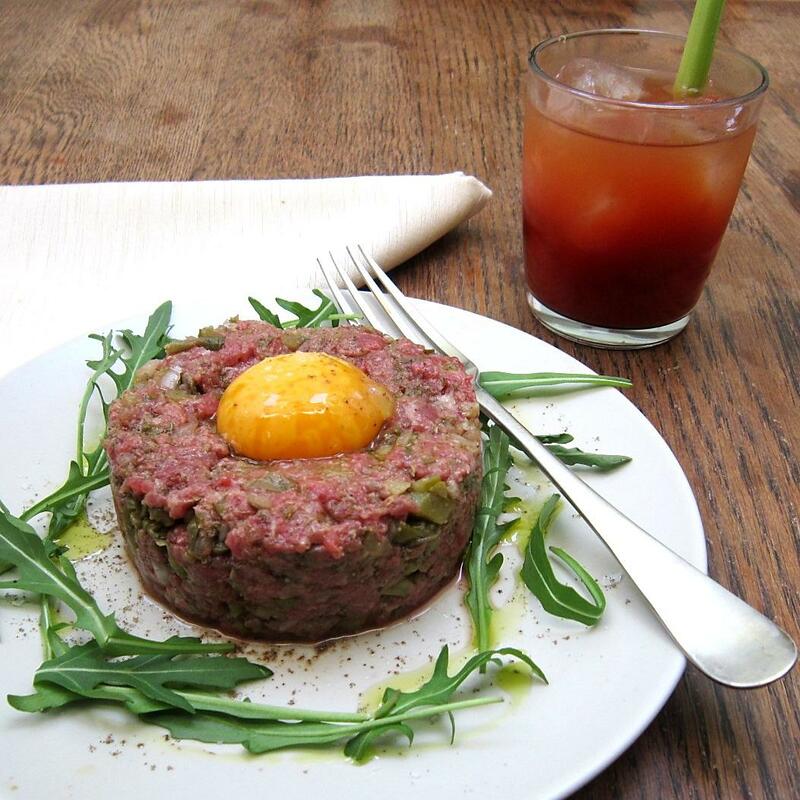 Finely diced raw steak mixed with capers, shallots, gherkins and topped with a raw egg. The modern version is reminiscent of a deconstructed tartare sauce, though the original dish was served with a blob of a la Tartare sauce on the side. Finely chopping, and not mincing, the meat is well-worth the effort. Sharpen your knives cos it’s all in the dicing. It can take more seasoning than you think. Taste and season as you go along, splashing in a dash of Worcestershire sauce and Tabasco, with a grating of Horseradish to give it extra punch. Some folk mix the egg yolk in, but I prefer it nestled on top, so it can ooze over the tartare with golden unctuousness. This is one to try for those that like their steak still mooing, but steer well clear of Tesco’s – though I’m sure many would argue that horsemeat makes for a superior tartare – and buy the best quality meat from a reputable butcher. I chuckle as one of the local butchers was taken to court for shooting deer out of season, but we are luckily spoilt for choice here in Devon. INSTRUCTIONS: Finely slice the steak into thin strips, discarding any fat or membranes. Slice the strips in half lengthwise and then pile them together and slice in the opposite direction to get a fine dice. 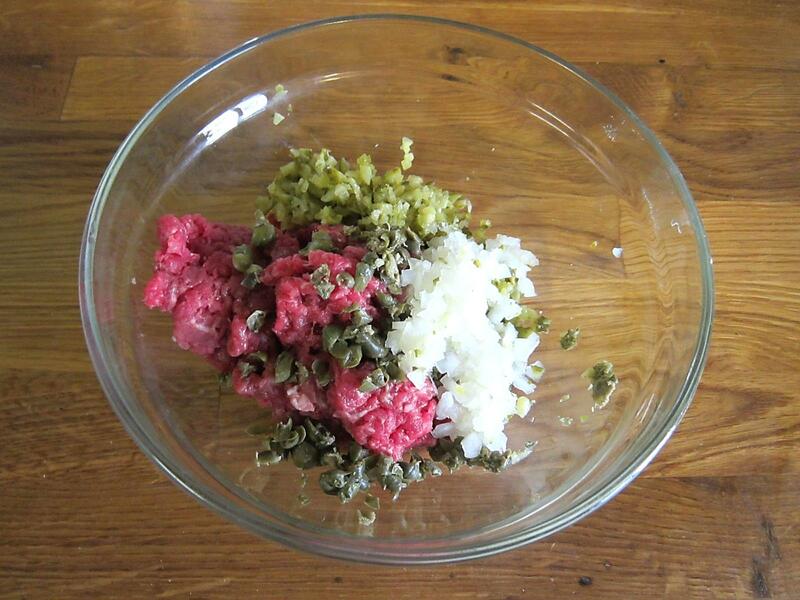 Mix in the shallots, cornichons, capers and season to taste. I love horseradish but like wasabi, you must be careful not to be too heavy handed with it or it’ll knock your socks off and overpower the dish, but it adds beautiful background pungency. Shape the mix into a neat round, surrounded by a nest of rocket leaves, and make an indentation in the top in which to sit the egg yolk. Sprinkle on a dusting of salt and pepper, a drizzle of oil, stir your Bloody Mary and enjoy!